Homilies delivered in a gently humorous voice but with a serious undertone by a Presbyterian preacher not afraid to reveal his own humanity. The president of San Francisco Theological Seminary, McCullough deals with the dozens of quotidian opportunities we all have for behaving with either grace or incivility toward our fellow human beings. 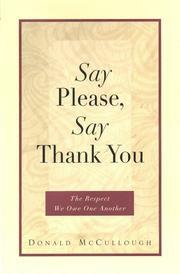 Counseling that “the neglect of courtesy leads to the collapse of community,” he examines small acts of respect, such as saying please and thank you, being on time, using nice stationery, tipping generously, and going home before the host falls asleep. By doing right in the little things, he says, you may well become the sort of person who knows right from wrong when faced with the big issues. And at the same time, you’ll be creating a more humane world. In 36 brief chapters, some titled with such admonishments as “Don’t Show Up at the Wedding in a Baseball Cap” and “Keep Your Bumper off My Tailpipe,” he makes his points using stories featuring Albert Einstein, Franklin D. Roosevelt, and W.C. Fields, characters from The Wind in the Willows, and most frequently, himself and his family. He also quotes such contemporary writers as M. Scott Peck and Robert Fulghum, with whom he seems to feel rapport. McCullough, who teaches theology and preaching at the seminary, knows how to preach without being preachy, and if there’s not much here that’s especially profound or original, there’s nothing offensive or controversial either. Values wrapped in a warm fuzzy.